The hot stove league is just ramping up throughout Major League Baseball with the beginnings of player movement discussions. The winter meetings will be upcoming and trades will be discussed as teams seek to create their 2017 rosters in hopes of playing for the championship in a little less than a year from now. Fans’ emotions cycle through the spectrum as hopes are raised with each announcement, often times met with disapproval and disappointment. The hot stove league is an excellent analogy for collecting baseball militaria. Watching for items that meet certain criteria poses many similar challenges. Does the item fit my collection? Is the item worth the asking price? Is it authentic (with provenance) Is there any room to negotiate? What impact will the item have in terms of how the piece might display? So many questions to be answered. After the transaction has been completed and the anticipation (waiting the piece’s arrival) has subsided, were expectations met, exceeded or dashed? Similar to how fans and front office people alike spend time evaluating the if the acquisition was a worthwhile expenditure, collectors also review what they buy. Baseball militaria has, so far, proven to be a very narrow field of focus for my collecting with so few items being available. I am open to acquiring artifacts from most time periods with my strongest interest lying in the 20 year-period leading up to the second World War. Very few artifacts ever become available beyond photographs (which are predominantly snapshots that are removed from personal photo albums). I have seen the occasional uniforms (two in the past three years come to mind) and a bat (that seemed to be dated closer, if not during WWII) outside of the smattering of ephemera and pictures. 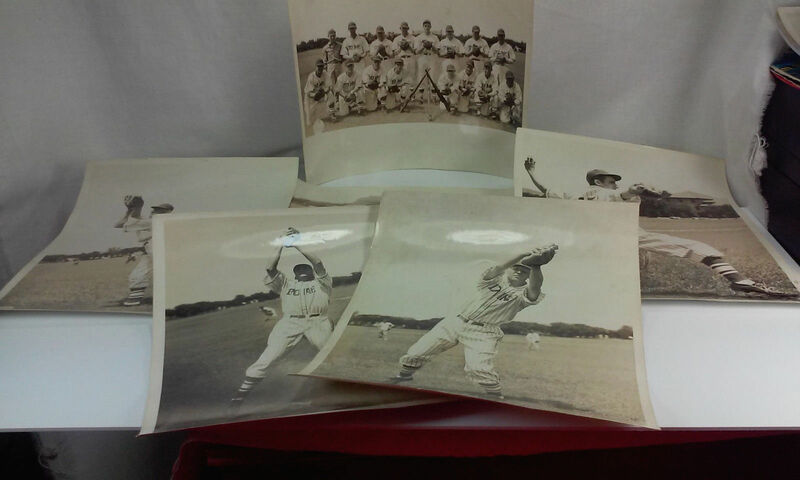 The auction’s images showed that there were at least five photographs (the sixth was mostly obscured by the other photos) of various subjects – ballplayers in different staged action poses and a team picture. I submitted my best offer which was accepted. When the package arrived a few days later, I was excited see the quality of the (what appeared to be professional) photos. Extracting the large, silver gelatin prints from the plastic sleeve, I noted that there appeared to be more than the six as was described in the auction listing. As soon as I began to sort through the eight prints, I realized that the seller sent me four copies each of two of the staged action-poses. The image that I truly wanted – the anchor to this set – was absent. I was not happy with the bad news. I did recall watching the same auction for several weeks before I decided to pull the trigger. What I didn’t realize is that the earlier listing was most-likely a different set from what I received. The seller, I am assuming, acquired a set of photographs from an estate and divided it in to two groups to be sold. The set that I purchased was merely a group of extras. Granted, the seller refunded the entire auction amount but I was without the photograph that I wanted. As of writing this, I haven’t left feedback on the transaction. If I let my frustration rule, I would leave negative feedback. However, the seller was polite and extremely prompt in taking corrective action. I have (four copies of) two professionally produced photographs that I didn’t pay a cent to acquire. In the end, evaluating this transaction in terms of the hot stove league, it is akin to inviting (to spring training) a washed-up player who has been out of the league for a few seasons only to return to win a roster spot.